In the last two decades the so-called embodied cognition approach has argued that cognition should be understood in adaptive terms, rather than in terms of information processing, manipulation and storage. This approach vindicates the constitutive role the body plays in understanding cognitive architecture and emphasizes the dynamic interactions between the agent and its environment through perception and action (Calvo & Gomila, 2008). From this standpoint, a cognitive behaviour is one that allows to exploit the information of the environment in different ways so that an organism can adapt in a satisfactory manner (Heras-Escribano & de Pinedo, 2018). Does this mean that we can attribute to organisms like plants the property of being agents with cognitive capacity? That plants exhibit a great adaptive capacity is shown by the different experiments carried out by plant neurobiology (for a detailed reading of the discipline see Calvo, 2016). This multidisciplinary field studies the flexible and adaptive behaviour of plants beyond the study of their biochemical characteristics and integrates results from research areas such as plant electrophysiology, cell biology, molecular biology and ecology (Calvo & Keijzer, 2009). The theoretical and experimental development of plant neurobiology motivates philosophy of mind to rethink what is meant by cognition or intelligence (Calvo, 2016). Intelligent behaviour, in an evolutionary sense, requires the organism to be sensitive to the different signals in the environment and to take the necessary actions to optimise its adaptation to it. Plants are a good example of this (Trewavas, 2017). They are not only capable of detecting numerous signals such as gravity, humidity or light (Baluska & Levin, 2016), but they are also capable of detecting elements such as soil structure, allelopathy or wind (Calvo & Keijzer, 2011). They are able to perceive neighbouring organisms and anticipate possible interactions by modifying their behaviour, maximising the evolutionary benefit of the organism (Novoplansky, 2015). It has been demonstrated on numerous occasions that there is communication through the different parts of a plant (Trewavas, 2003). It should be noted that the study of plant behaviour can be traced back to the work of Charles Darwin, who suggested that the “brain” of plants is at the point of root growth and it has the power to direct the movements of adjacent parts of the plant itself (Darwin, 1880). The relevant question is whether this adaptability has the features that we should expect of a creature with cognition in the general and minimal sense used in the perspective of embodied cognition. One of the main ideas of this approach is that cognition is a biological phenomenon that allows the environment to be manipulated in different ways so that it systematically benefits the organism that behaves in this manner (Calvo & Keijzer, 2009). Under this view, a plant should be able to exploit the characteristics of its environment to ensure its adaptation to its surroundings. Plants should be able to perform actions such as integrating information or making decisions in such a way that their adaptive coupling to the environment could be qualified as cognitive (Calvo & Keijzer, 2009). One of the experiments that point in this direction has been carried out with climbing plants (Phaseolus vulgaris) by Calvo, Raja and Lee (2017) using the time-lapse technique. These researchers analysed the behaviour of the plant when moving circularly in search of support (the following time-lapse clip shows this behavior). In the experiment, the plant is located inside a growth chamber and close to a vertical support. Initially, it begins by making circular movements, but when it is close to the support it modifies the circular path and ends up making elliptical movements to try to grasp it (a movement called circumnutation). The hypothesis at stake is that the plant has perceived the possibility of circumnutating around the support and takes advantage of this possibility. This should not be understood as a metaphor: the behavior reveals a certain degree of endogenous control, that is, the plant controls the manoeuver of approach to the support (if it did not control it, the movement pattern would not be modified in its form, acceleration, and deceleration). These experimental results are congruent with the idea that the plant exploits internal and external information that guides growth, that is, that guides the way to approach the support without being a mere automatic response. The plant integrates exogenous and endogenous information to adapt phenotypically to environmental contingencies. Although plants have always been seen as creatures with a non flexible and automatic behaviour, embodied cognition allows us to understand them as agents with (minimally) cognitive capacity; that is, with flexible capacities that adapt to the particular circumstances of their environment. Terms such as ‘cognition’ or ‘intelligence’ should be understood as a set of biological functions that exhibit flexibility in the face of environmental contingencies. 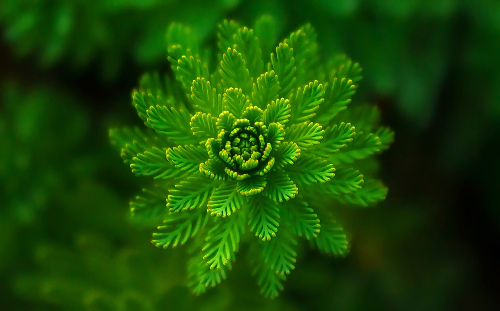 The different studies in plant neurobiology and the reinterpretation of evidence in light of an embodied perspective of cognition make us think of plants as creatures with highly complex, adaptive and, therefore, cognitive behaviour. Baluska, F. y Levin, M. (2016). On having no head: Cognition throughout biological systems. Frontiers in Psychology, 7, 1-19. Calvo, P. y Gomila, T. (2008). Directions for an embodied cognitive science: toward an integrated approach. En P. Calvo y T. Gomila (eds.) Handbook of cognitive science. An embodied approach. Oxford: Elsevier. Calvo, P. y Keijzer, F. A. (2009). Cognition in plants. En: F. Baluska (ed.) Plant-environment Interactions. Bonn: Springer. Calvo, P. y Keijzer, F. A. (2011). Plants: Adaptive behavior, root-brains, and minimal cognition. Adaptive Behavior, 19, 155-171. Calvo, P. (2016). The philosophy of plant neurobiology: A manifesto. Synthese, 193, 1323-1343. Darwin, C. (1880). The Power of Movement in Plants. Londres: John Murray. Heras-Escribano, M. y De Pinedo, M. (2018). Affordances and landscapes: Overcoming the nature-culture dichotomy through niche construction theory. Frontiers in Psychology, 8, 2294. Novoplansky, A. (2015). Future perception in plants. En: M. Nadin (ed.) Anticipation Across Disciplines. Cham: Springer. Trewavas, A. (2003). Aspects of plant intelligence. Annals of Botany, 92, 1-20. Manuscript received on may 27th, 2018. Accepted on July 8th, 2018. Osorio Mancilla, J. (2018). ¿Son las plantas organismos con capacidad cognitiva? Ciencia Cognitiva, 12:3, 54-56.